Would you like this bracelet personalised? A little bracelet with a pink tourmaline gemstone set into a love heart. Such a delicate and pretty bracelet that has a loop to be worn when your little girl is around 3 them extended as they grow. We can personalise by adding a disc or heart too. 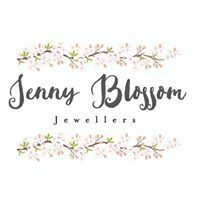 All our jewellery comes beautifully packaged in a free Jenny Blossom gift box and gift bag and we can add a gift card for your special message. Own Children's silver charm bracelet with purple heart? Why not be the first to leave a review.